Train GPs in the preventive aspects of health care. Train GPs in the management of common conditions presenting to the primary health care centers and refer cases needing higher level of care appropriately. Improve the IT and communication skills of GPs working in the primary care centers. Aware GPs of the vast resources and guidelines to access in time of need. Online course with on-site contact sessions fortnightly and regular on line supervision (24-30 contact days spread over one year). Course content will be shared with participants through experts in the fields of family medicine (local and international) through online medium and minimum physical presence will be required. The online course content will be followed by a fortnightly session in KMU with the relevant expert to discuss and clear concepts. Quality assured by Quality Enhancement Cell of KMU. Wonderful opportunity for doctors working as GPs to equip with up to date information and learn from experts in the field of family medicine. 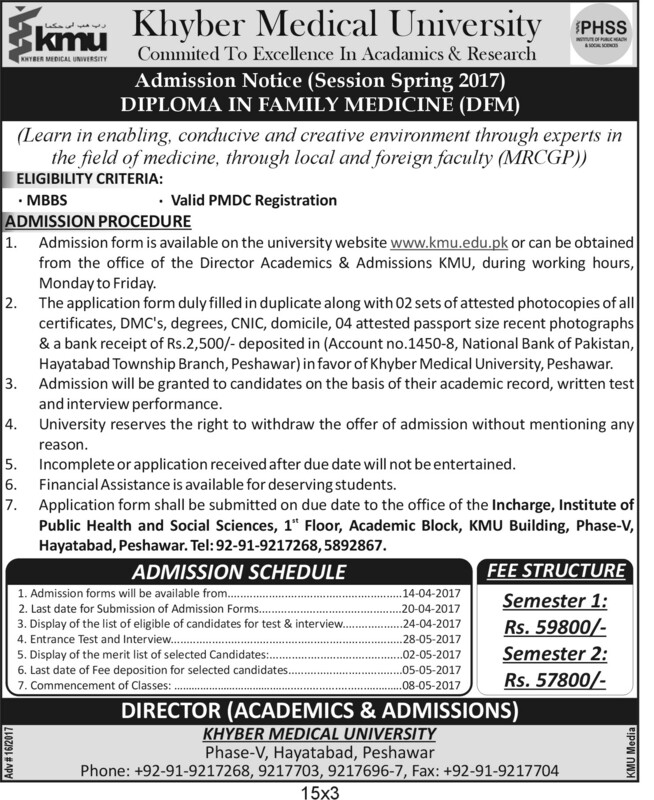 Admission form is available on the university website www.kmu.edu.pk or can be obtained from the office of the Director Academics & Admissions KMU, during working hours, Monday to Friday. The application form duly filled in duplicate along with 02 sets of attested photocopies of all certificates, DMC’s, degrees, CNIC, domicile, 04 attested passport size recent photographs & a bank receipt of Rs.2,500/- deposited in (Account no.1450-8, National Bank of Pakistan, Hayatabad Township Branch, Peshawar) in favor of Khyber Medical University, Peshawar. Admission will be granted to candidates on the basis of their academic record, written test and interview performance. University reserves the right to withdraw the offer of admission without mentioning any reason. Incomplete or application received after due date will not be entertained. Financial Assistance is available for deserving students. Application form shall be submitted on due date to the office of the Incharge, Institute of Public Health and Social Sciences, 1st Floor, Academic Block, KMU Building, Phase-V, Hayatabad, Peshawar. Tel: 92-91-9217268, 5892867.